​All images to be used as your background for filming must be saved to the iPad that will be used for filming. 2. Tap the "+" in the top-right corner, then choose "Create New Project." 1. Tap on the + on the bottom-right portion of the screen. The background image for your first segment of green screen filming should be in the bottom layer in the Green Screen app. 2. Select "Image" and choose the background that is saved in your camera roll. 3. Tap the first + on the screen and select "Camera"
2. After the 5 second countdown you can to begin to record your video. When you have finished, tap on the black square to stop the recording. 3. You will be given three options: Preview your video, Show the export options, and Save to the Camera Roll. Choose "Preview your video" to make sure it is complete and recorded the way you intended. 4. 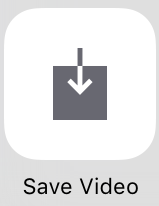 If the video looks good, either tap "Done" and select "Save to Camera Roll" or tap the share icon and choose "Save Video"